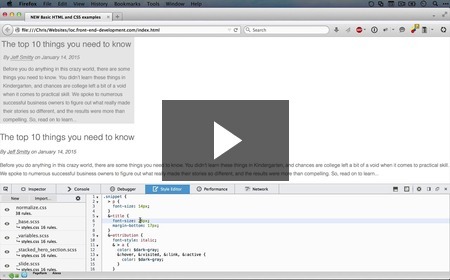 10 NEW videos on CSS strategy, SASS variable scope and more! 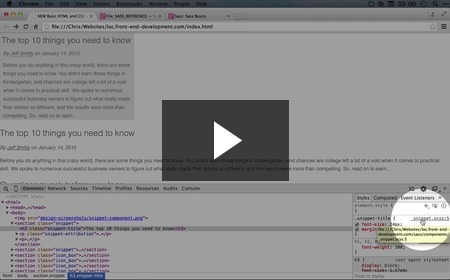 This week we're releasing a new batch of videos in the "Front End Development" collection that tackle some of the nuances of SASS and CSS. For example, if you have two elements on a page with the same background color, should they share a class name? Or, what happens if you set a SASS variable in one selector and then use it in a different selector? If you're working towards becoming a front end expert, these are things you need to know. How to troubleshoot SASS nesting and prefixing conflicts New! It's been a while since we've reviewed our template. 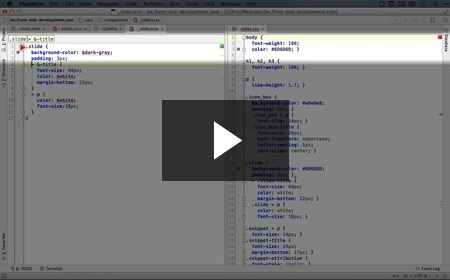 In this video, we go back to the template and find a little problem with a header that can be traced to an inaccurate assumption how how we can structure our SASS. Review of the typographic elements we have templated New! Here we look through our mockup for typographical elements we've coded and identify a couple we still have left to tackle. 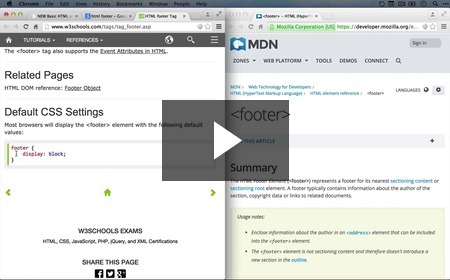 How to use a footer HTML tag and add a copyright symbol New! 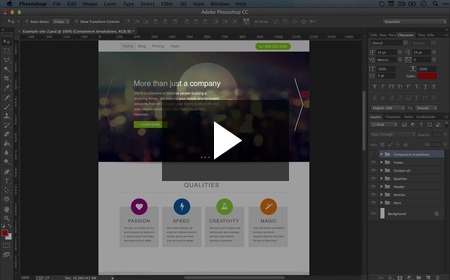 Adding SASS scaffolding for the footer New! Once we have the HTML code for our footer section, it's time to give it some style. Before we can do that, we have to figure out where our styles go and what selectors to use. Here we do just that. Setting a default text color for the footer New! When there are multiple colors competing for dominance in a component, it's tough to figure out what kinds of defaults you should user. 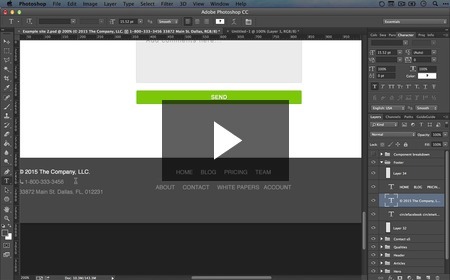 In this video we evaluate what might be a good default color for the footer and talk through the process of capturing the hexadecimal value of the color. Why to avoid creating classes for common CSS property values between elements New! With CSS, there's a huge amount of freedom when it comes to organizing how properties apply to selectors. One pattern you'll begin to recognize is when multiple elements have the same variation of style. In those cases, does it make more sense to create a unique class name and associate styles with it, or to apply the style individually to the elements with those properties? In this video we explore the options. 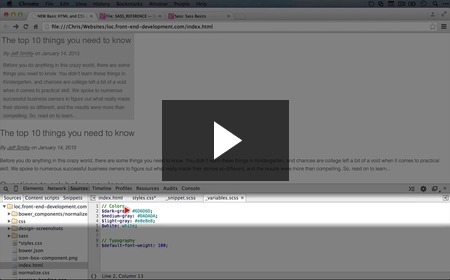 Troubleshooting editing SASS partial styles with the browser inspector New! How to adjust spacing between paragraphs in CSS New! In this video we cover a staple of CSS problem-solving: How to change the amount of space between paragraphs. How variable scope works in SASS New! If you've worked with a programming language before, the idea of variable scope will be familiar to you. If not, then this video will throughly explain the idea. 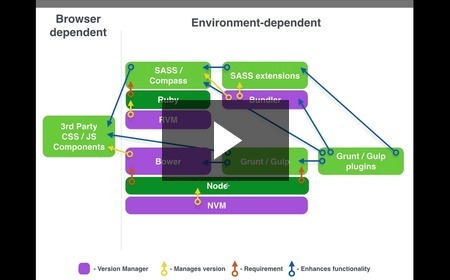 Even if you are familiar with scope, this video might point out some differences between how SASS interprets scope and how you might be used to it working in other languages. 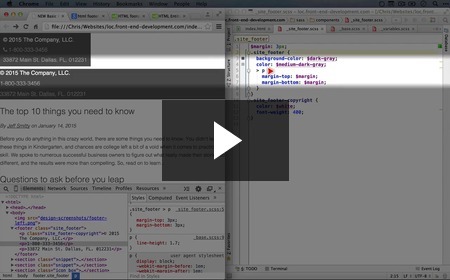 How to use HTML comments and preparing to code the footer menu New! 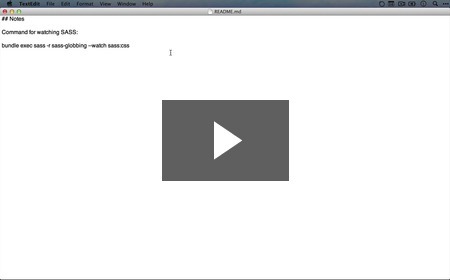 Here we comment out some of our HTML code to give us some visual room to begin building our footer menu. 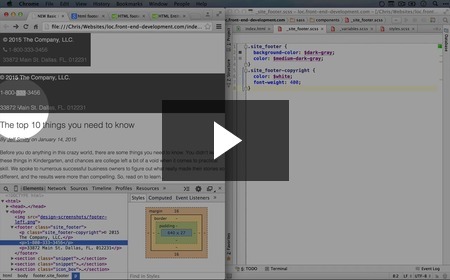 20 NEW videos on how front end software interrelates, plus Bundler and source maps! One of the things that makes working with SASS a challenge is tying the CSS the browser uses with the SASS that we write. Instead of rummaging around your code for clues, you can instead set up something called a 'source map,' and this will allow you to jump directly to the SASS code responsible for the CSS you're viewing in a browser inspector. Super cool! 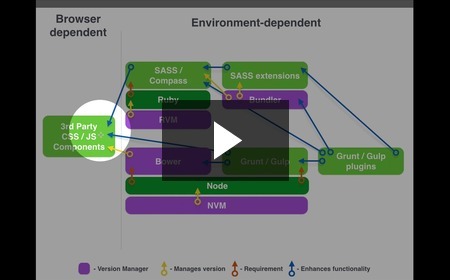 So we start out this week looking at how source maps work, and then continue on to talk about why there are so many individual pieces of software that go into front end development, and how they connect to one another. 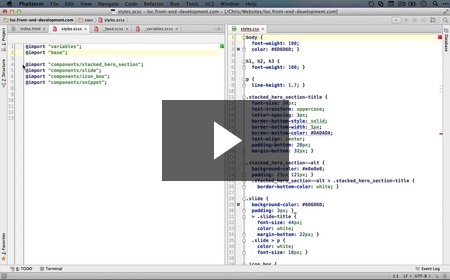 This was one of my favorite videos to make and I've made it free as a way for front end developers to explain to the non-initiated why the added complexity of all this software is justified and simplifies things down the road. Finally, we talk about Bundler and how to use SASS extensions to further increase the power that SASS has out of the box. Good stuff! Reassurance that splitting our single SASS files into multiple partials is not over-engineering New! Our project, thus far, is not terribly complicated. It might seem that splitting out our SASS into multiple files is overkill, and if that's what you're thinking, you would be right if our project wasn't destined to become more complicated as we move forward. Most modern web projects, especially at the enterprise level, requires a structure that scales well for multiple front-end contributors and rapid CSS pre-processing, and using partials can help make that happen. How CSS source maps work and how they allow us to inspect the SASS source of CSS properties New! I'm so excited you've made it to the video where I get to show you how you can use the browser inspector to find the exact location in your SASS where a CSS rule is created. This is made possible through the use of CSS source maps, and it's a beautiful, beautiful thing. 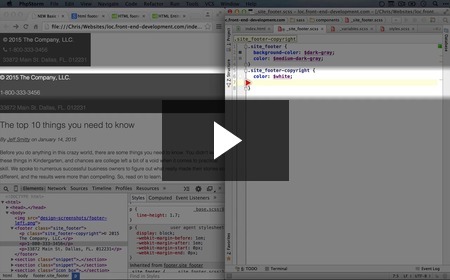 How to use CSS source maps in Firefox New! While we use Chrome throughout this series, Firefox also supports source maps, so we do a quick demonstration of how to use them here. 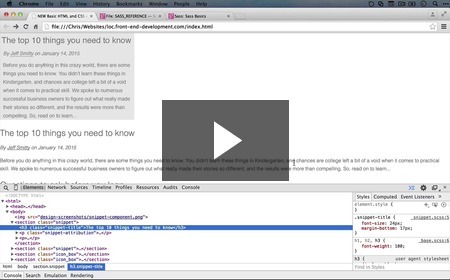 How to navigate to SASS variable definitions in the browser New! Not only can you delve into your SASS directly in the browser, but you can track down where variables are defined. In this video we show you how. Why it makes sense to use the SASS Globbing extension for automatically including partials New! Now that we've separated out our SASS into files that correspond to components, we now have several manual steps we have to take to add a new component in. Luckily, we can automate one part of this with the SASS glowing extension, and in this video we talk about how it works. 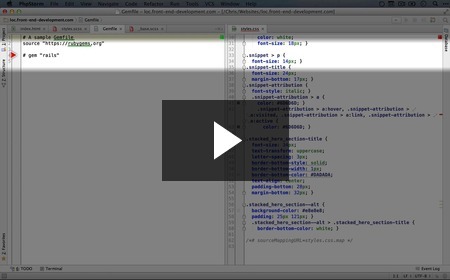 How to install a SASS extension and automatically include partials from a folder New! One of the benefits of SASS is the rich library of extensions developed by the SASS community. 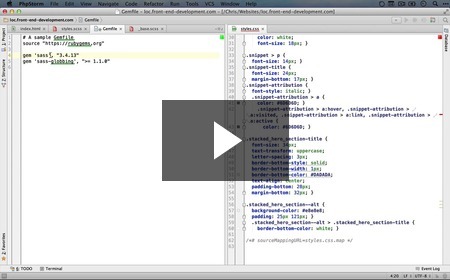 Here we walk through installing the 'SASS globbing' extension to automatically pull in all partials in a specific folder. The benefits and costs of using the SASS Globbing extension New! SASS Globbing is awesome, but it's important to understand how it works so you don't get bit by it later on. In this video we summarize why it's so useful but also in what situations you might want to steer clear and just manually add your partials. 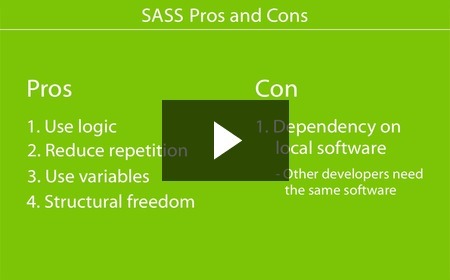 The pros and cons of using local software like SASS and Bower for front end development New! Throughout this series we've introduced a number of pieces of software, including Ruby, Bower, SASS and SASS extensions. Hopefully you're sold on the usefulness of these tools, but you also might get a sinking feeling when you think about how you're going to help a fellow developer set up their local environment. Here we talk about the potential issues of using local software for front-end development, in a large part so we can address how to resolve them in later videos. Map of local software needed for front end development and how the parts relate to one another New! Why there are so many individual pieces of front end software New! Wouldn't it be nice if there was just one piece of software you could turn on to get all the tools you need for front end development? It would, but there's a good reason that isn't happening right now. Here we discuss briefly why. 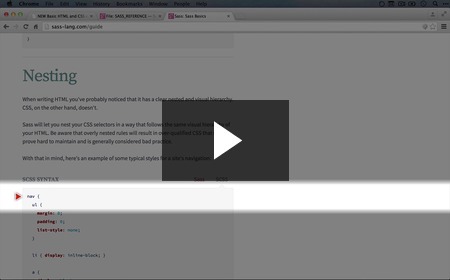 How to learn more about SASS with the SASS documentation New! So far we've talked about how to use variables, partials and includes in SASS, but not about how we learned how to do that. 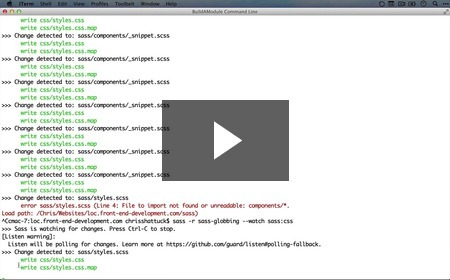 Here we step back for a minute to go to the source and show you where you can learn more about SASS conventions and syntax. Why we're choosing not to use Compass just yet New! 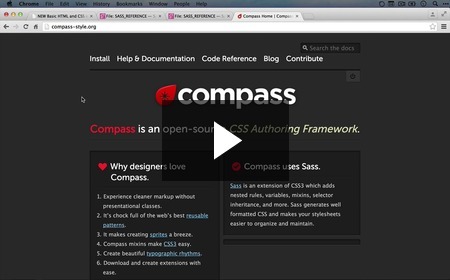 When many front end developers learn how to use SASS, they use it in tandem with a tool called Compass. However, unless your project really needs Compass, there are some compelling reasons to use straight-up SASS. In this video we talk about what those reasons are. How to install Bundler New! Bundler allows you to install specific versions of gems (like SASS and SASS Globbing) for each project. 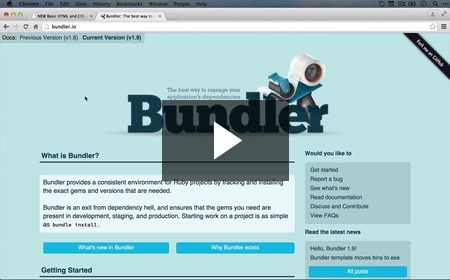 Here we take the first step and install Bundler. How to generate a Gemfile with Bundler New! 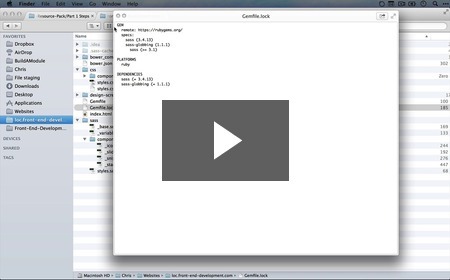 How to add dependencies to a Bundler Gemfile New! Just like we did with Bower, we're going to list out the dependencies our project has and run a command line command to install them. With Bower, it was packages bundled through Packagist. With Bundler, it will be with gems supplied by any online source that makes gems available. How to use project-specific versions of gems with 'bundle exec' New! Bundler doesn't affect the gems installed in your local system, so to use them, you have to prefix your commands with 'bundle exec'. Sounds simple, but we walk through it in this video as well as demonstrating how to test if 'bundle exec' is actually working. 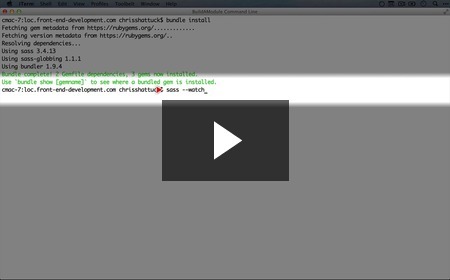 How the Bundler Gemfile.lock file works New! While we can specify version ranges in our Gemfile, our Gemfile.lock file keeps a record of the specific versions being used in a project. Here we talk through the purpose of the lock file and how to work with it. 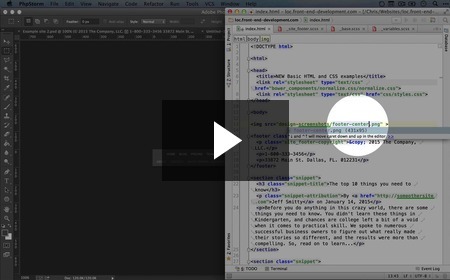 How to use 'bundle exec' with 'sass watch' and 'sass globbing' New! 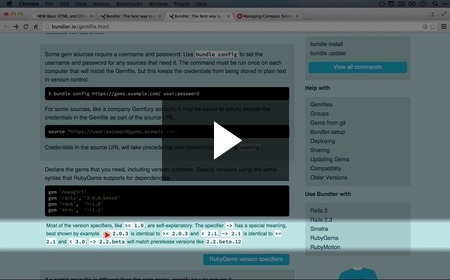 We know now that the 'bundle exec' command is how to route our commands through bundler, and in this video we demonstrate how that works. How to specify a version range in Bundler that updates to the latest patch version New! Earlier in this series we used the Bower package manager to manage which versions of third party libraries we were going to use. In Bundler we can do the same thing, but the syntax is a little different. 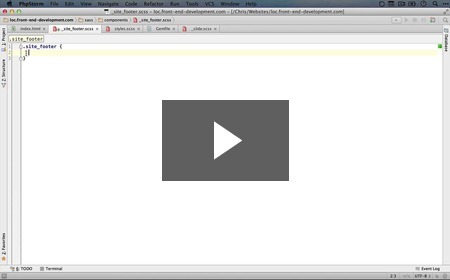 In this video we demonstrate how to set up a version range with a tilde and greater-than symbol. Setting up a README.md file and how we're automating documentation New!